Take some time to enjoy these fabulous links, you won't be sorry! Lipstick & Lollies is loving the new Mrs. Draper and swooning over her 60's wardrobe! I think she makes us all want a time machine! 100 Inspirations shows us how to get the infamous Coachella look! Stop by to see how you can recreate this Kate Bosworth look for under $130! Congrats for making it into the it list once again! You have great style! Thank you so much for commenting on my blog! Feel free to pass by again anytime. Congratulations ! No doubt you got great style ! hey girl wow your blog is amazing!!!! i just followed you and i hope to hear you again!!! have a lovely weekend!!! greetings from Italy. another great post dear !! full of inspiration... Totally im follow you on bloglovin, would be great if I could see you around there .! Dont know what happend agaiin with my internet conection , anyway ....I will repit. Another great post dear!! its full of inspirations, im following you on bloglovin SURE, would be great if you would follow me round there too.!! btw, i've followed your blog.. I love Kate Bosworth's festival style - it is so effortless let so chic. Great post, checking out some of the links. AH, this is adding to my already procrastinating Friday! haha... checking these out! Have a wonderful weekend! Thanks for leaving a comment on Veggie Table mostly because it lead me to your blog! So cute! I am always looking for new fashion ideas! Have a great weekend! Thanks for all the links you shared! Ooh I'll have to check out these links! Ohhhh nice links! They are so lovely! 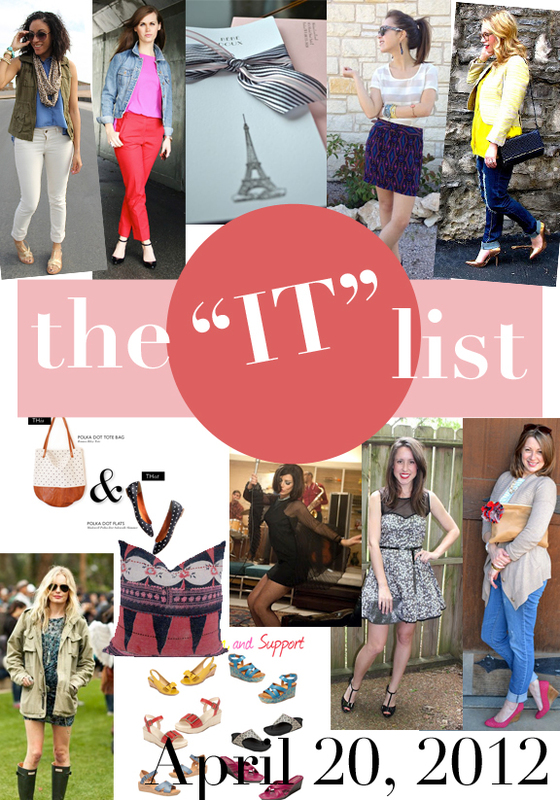 Love the it List! Seems like such a great thing to be a part of! Wow, so many! I'm saving this post to check later! Congrats on getting onto the list!!! Your outfit is so cute, love it. This is my blog giveaway and I think it might be a great statement piece for you. Come check it out and have fun. Great round-up of inspirational style and links. Have a wonderful weekend hun! could you just send me a care package with all of these things in it?! please and thank you!! This is a wonderful post idea! Loved it! I want the colorful wedges too! Hope you are having a wonderful day! thanks for sharing this with us, i'll check all on the list! I'll definitely have to check them all out! I love everything on your list. Everything looks amazing. We are having a giveaway over on our blog, please stop by and enter. Awesome, awesome, awesome post, thank you for sharing all these amazing goodies! So pretty! Loveeeee this post! Amazing style inspiration here! Very cool to be in the "IT List"! Your blog is very clean and elegant, I love it! Love this, such a great list! Love the white shirt dress in post below too! You have a great eye for style. Thanks for sharing such lovely links and congrats for being featured! Thank you very much for your lovely comment, Giovanna! Ooh, fun! I'm excited to check out this list!